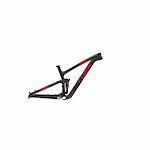 Brand new size m BXT carbon frame with BXT 15x100 rigid carbon fork. Also included is a brand new set of Fulcrum 29er wheels. All new, was planning on building it for myself but no time. 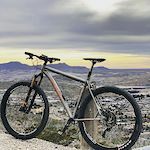 2018 NS Bikes SNABB FRAMES sample sales!! Breadwinner Goodwater frame w/ JPaks custom frame bag. Internal brake and dropper cable routing. 12x148 boost rear spacing. 29 or 27.5+ wheel size. All parts available for a complete build.
. YT Jeffsy CF PRO 29 Boost 2018 carbon fiber frame and DVO Topaz T3 Air shock upgrade. . Super low miles, very clean frame. Got a killer deal on a different frame, so I swapped parts off this. . Lightly ridden , mostly XC type rides. XL 2017 Chumba Stella Titanium Frame. Run it 29" or 27.5+. Geared or single speed. XC, trail or backpacking adventure. The ultimate hardtail. This frame is in fantastic shape and rides like a dream.